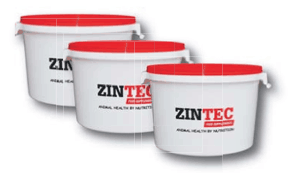 Zintec Feed Supplements is a family owned and run company that was founded over 25 years ago. They specialise in producing top quality, high specification feed supplements for cows, beef, sheep, lambs, horses and ponies using chelated trace elements. Zintec’s manufacturing facility meets all current EU Legislation and is committed to both UFAS and QMS feed assurance schemes. We are keen to meet all the requirements of modern livestock farming and have designed and manufactured products for use with organic farmers and growers.